3 Healthy Bars to Travel With AND 1 Day Book Sale!! I have such exciting news: My eBook is being relaunched and included in a fabulous paleo book bundle sale! TODAY ONLY, you can get the Kindle Edition for a mere $.99 !!!! There is a growing selection of healthy, whole food-based bars which is AWESOME for those of us who want to stay healthy & energized (and stay on track!) while traveling. If you are traveling this summer, here are 3 bars to consider taking with you. Epic Bars: Sustainably-raised, 100% organic grass-fed meat combined with minimal, whole ingredients. No sugar, grains, gluten or dairy. I love the Bison Bacon Cranberry flavor! Gather Bars: Hazelnuts, maca and cocoa? Macademia nut, pumpkin seeds, coconut & dates? Sign me up! I’m all for bars that are grain-free, fruit-sweetened only bars with lots of healthy fats to balance blood sugar. PaleoKrunch Bar (Original): Sometimes a granola bar hits the spot. This bar by Steve’s Paleo Goods rocks. Coconut oil, almond meal, sunflower and pumpkin seeds, shredded coconut and a smidge of honey=simple, healthy, tasty. http://choosinghealthnow.com/wp-content/uploads/2016/05/apple.png 0 0 admin http://choosinghealthnow.com/wp-content/uploads/2016/05/apple.png admin2014-06-18 05:31:232014-06-18 05:31:233 Healthy Bars to Travel With AND 1 Day Book Sale!! 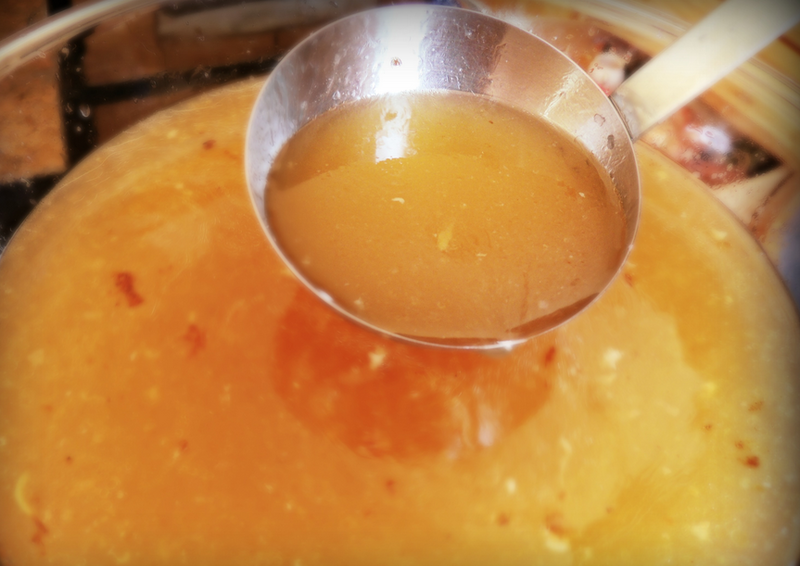 Making and consuming bone broth is a sacred tradition I highly encourage. If you’ve never made it and are intimidated, this step by step guide will help you successfully make this nutrient dense elixir. Cover 2 lbs of raw bones in large pot with cool, filtered water (or you can roast them to boost flavor-30 mins at 350 degrees). Add vinegar and let sit for 30 mins (I like apple cider vinegar, coconut vinegar or sometimes I squeeze a fresh lemon in there). Add rough chopped veggies (except garlic and parsley), herbs, spices, and salt. 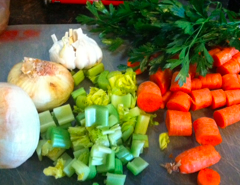 Reduce heat to a slow simmer, remove impurities that rise to top in the first few hours and discard. During last 30-60 mins, add parsley and garlic. Let cool and then poor through strainer to remove any bones and veggies. Store in mason jars in fridge for up to 5 days or freeze. Bone broth can be sipped from a mug, used as a base for sautéing vegetables or meat, added into sauces, or made into soup. It is a wonderful staple to include weekly (daily is even better!). 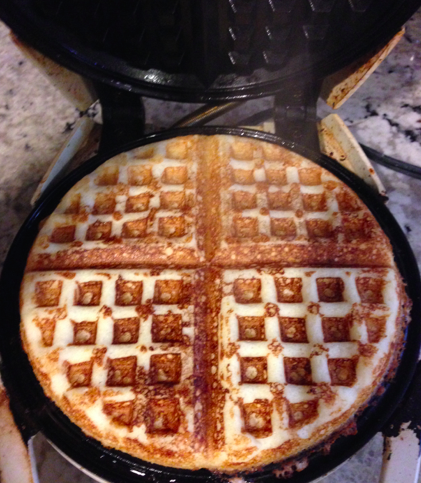 Below is a wonderful recipe for waffles that uses coconut flour and whey protein powder instead of grains. 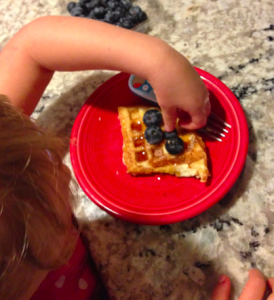 They are fluffy, delicious and much more filling than traditional grain-based waffles. Whether you have a gluten intolerance or are just making a choice to eat more nutrient-dense foods, you’re sure to enjoy this recipe. Seen below is my daughter topping her waffle with fresh, organic blueberries (underneath is Kerrygold butter and a little coconut nectar). Preheat waffle iron to high. Combine the dry ingredients in a bowl. Combine the wet ingredients in another bowl. Slowly add the wet ingredients into the dry. Let sit for 5 minutes. Bake according to your waffle iron directions (I spray my waffle iron with THIS Coconut oil spray). Enjoy! Serve with Nature’s Hollow Xylitol syrup. Makes 10 waffles.